Sharon Caetano has been a member of Bradbury Estate Realty since 2015, joining as the team’s ‘handy-woman extraordinaire’ and later as a licensed realtor. She does anything from painting and tiling to baseboards and gardening on behalf of clients, transforming their homes into gorgeous, ready-to-list properties. She’s a wife, a homeowner, a businesswoman and a mother of four who tackles everything she does with contagious enthusiasm. Sharon loves working with people, from kids right up to our aging population. Real estate is definitely not her first career… it’s her third(ish), with a lot of ‘significant hobbies’ along the way! In her past, her largest strength was being client-centered. With training in Physical & Occupational Therapy, and then later as a gym owner, personal trainer and Pilates instructor for 12+ years, her personal and business skills were honed. Yes, she needed knowledge and professionalism in each field, but that needed to be combined with putting her clients’ individual wants and needs first. This philosophy, along with a healthy dose of kindness and hard work, lay the groundwork for Sharon’s real estate relationships. Before settling in Burlington with her family, Sharon lived in three cities and three houses in under a decade. She’s worked through several major home renovations (even on HGTV), constantly renovating, reupholstering, decorating, gardening, and improving. Life is constantly moving, but her family is not. They’re in love with Burlington! Sharon now uses her passion for home improvement and DIY to help clients using the Bradbury Estate Realty Client Give Back Model Let Sharon put this passion to work for your home and family – just give her a call! What is the bradbury effect? Using our Client Give Back to transform a home into it’s absolute best, and our clients into raving fans! Real estate is competitive, and today’s market is often very fast moving. At Bradbury Estate Realty, we believe in working hard for our commission, and giving back to our clients and community. 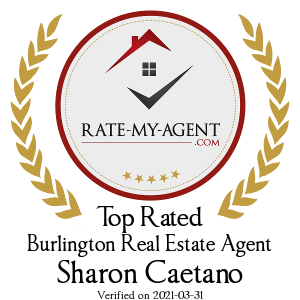 At the end of December I received notification from Rate-My-Agent.com that I had received a ranking of Top Real Estate Agent in Burlington for 2018. The review site published and compiled the list of top rated Burlington agents based on ratings and reviews received during the past year. The reviews are reflective of how my 2018 clients wanted to take time out of their busy schedules to support me by sharing their comments and reviews, the value that they placed on my services, and the positive experience they had working with me. Thank you to my 2018 clients for your trust in me, and for sharing your positive experience with others. Sharon is an amazing human. She is so professional and efficient. She made this process so easy and stress-free. Sharon and her team are RockStars!!! We met Sharon through a customer at our Benjamin Moore store in Burlington – NEO 1 paint & Decor. The moment we talked felt like we had been friends and known each other forever. Sharon is the author of happy endings to many stories. We told her our story and unlike other Realtors, there was no pressure sincere genuine passion shone through to help us reach our happy ending. Highly recommend her and the Bradbury team. – Pauline, Bill, Kodi and NEO 1 Team! We met Sharon at an open house and instantly connected with her. Asking her to help us find our first home was the best thing we could have done in our real estate journey. She helped us through the whirlwind of showings, intimidating process of putting together an offer, and shared our happiness when we found the right one! Knowing we were going to do some upgrades to our house, she connected us with an interior designer to help us refresh our dated home. She got us off on the right foot by purchasing the paint for our home – a gesture of kindness that is above and beyond anything I would expect from a real estate agent. Since then, she continues to check in with us to see how things are going and is a great resource for advice on home renovations. We did not think that when we asked her to help us out as a real estate agent that we would be getting a friend out of the deal as well. I cannot recommend Sharon enough. She really is an amazing human being! We met Sharon by chance when we made an appointment to view one of her listings that we were interested in. We recently had two agents out to our house before listing it for sale, but we instantly fell in love with Sharon! We asked her if she could also come look at our house to list it. We went with Sharon to sell our house and the amount of work she dedicated to researching our unique country property before the listing was incredible. She is a breath of fresh air! Her hands-on approach to getting the work done is beyond any agent we have ever heard of or worked with in the past. Sharon goes way above any expectation you can imagine to help you get your house ready to sell, from helping clean, paint, babysit, whatever it takes! We are actually sad that we are not in the market to just keep selling and buying houses so we can keep working with her. We have gained a friend. If you are looking for an agent, we highly recommend her. We partnered with Sharon to sell our home for a professional relocation given her excellent record and expertise. Sharon took the steps to make sure our home was not only ready for sale, but under her care during the duration of our listing. She went above and beyond caring for our home in our absence making our relocation an easy transition knowing our home was in trusted hands. Sharon is knowledgeable, hard working, passionate and reliable in every aspect of her work. We would 100% work with Sharon again in the future. Sharon is hands down the best realtor I’ve ever met! I went to one of her open houses and instantly wanted her to sell me a new home. Within the week she had shown be tons of properties and helped me buy my new home in Burlington. If you’re looking for someone who’s down to earth, caring, and willing to work hard to get you what you want, Sharon is the one for you. I have known Sharon for about 10 years and have always been impressed with her integrity and passion for life. Nothing is too big to handle for this enthusiastic realtor, and she treats her clients with loving professionalism. Sharon is an exceptional Realtor. She puts her all into every home and is not afraid of hard work. She is fantastic with her clients. Thinking of buying, selling or renting? Subscribe to get updates about your desired neighbourhood.